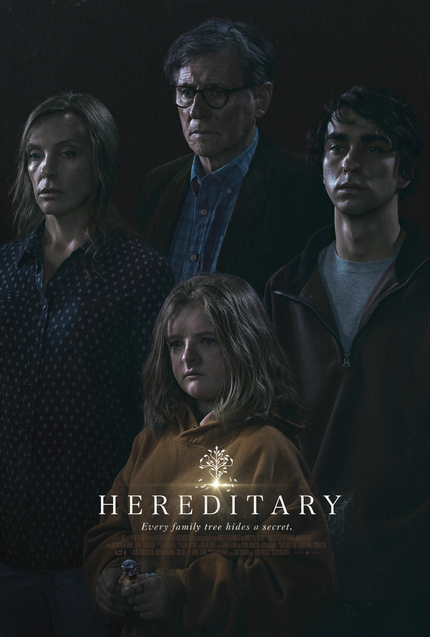 Ari Aster's Hereditary is an emotionally devastating family thriller, a terrifying supernatural mystery, and one hell of a complex horror film. This is the kind of film that builds tension for every one of its one-hundred-twenty-seven minutes, and when that dam finally bursts, floods the audience with the kind of traumatic revelations that will haunt them all the way home. It's one of the best horror films in recent memory, and the kind of film that will have critics and analysts sparring for decades to come. Hereditary is amazing. Annie Graham (Toni Colette) is an acclaimed artist suddenly thrust into mourning when her estranged mother passes away. The two were never terribly close, but they share enough traumatic history that Annie's grief reverberates through her family unit. The four of them, husband Steve (Gabriel Byrne), son Peter (Alex Wolff), and daughter Charlie (Milly Shapiro), live a relatively common life in a home in the woods. A home that will soon play host to a number of strange goings-on that threaten to tear the Graham family apart in a way that is as psychologically gory as any slasher. Hereditary is a film that is as much about the impact of grief and family conflict as it is about things that go bump in the night. Toni Colette's performance is an astonishing and exhausting portrait of a woman on the edge of sanity. Unable to cope with the loss of a mother with whom she shared a tense relationship at best, Colette attempts to retreat into her work as a miniature artist, only to find that this for of self-care is as damaging as it is cathartic. Like any family, the Grahams are less than perfect. Annie's artistic idiosyncrasies conflict with her husband's pragmatism. Outcast adolescent daughter Charlie shares her mother's artistic tendencies, focusing her energies on creating dolls from discarded objects as a way of making sense of her own world, while stoner son Peter attempts to navigate his way through the social minefield of high school. Four characters, four relationships, each unique and well-drawn, and each affected profoundly broken. For the first hour of the film, each of these relationships become increasingly strained, first by the individual reactions to the loss of the woman whose shadow falls over the family, and then again when guilt over a poor decision that ends in tragedy threatens to destroy everything they are. Aster's script leaves a trail of breadcrumbs that gently lead the viewer toward the realization that not only is something not quite right, it's just not natural. Nowhere is this feeling of unease as obvious as in the incredible performance of Toni Colette, destined to be one of the most talked about acting performances of the year. Colette's Annie is the one tasked with bringing the family together, only to find that she's barely holding it together herself. When she seeks help at a local group grief counseling session, she unburdens her soul in perhaps the film's clumsiest exposition dump, but Colette's performance makes the moment work and suddenly things begin to become clear, or so we think. Strange events begin to happen and the audience is left to try and decipher their meaning without a lot of assistance from the narrative, or so we think. We are so caught up in what is happening -- the tragedies, the miracles, the eerie feelings, the visions -- that we forget to think about what has already happened. As the story of Annie's mother and her history begins to become clear(ish), Hereditary takes a turn toward the insane. The final reel is an express train to madness as the story's many disparate parts begin to come together. I've rarely felt as continually invigorated by a film as I was during Hereditary's boldly extended climax. As we watch it, the film's final half hour seems to make little logical sense, it's more a kaleidoscope of terrors, not unlike the terrifying boat ride in Willy Wonka and the Chocolate Factory. However, as the film ends, careful viewers can start to put together the pieces that were laid out from the beginning. Where the first ninety minutes of Hereditary is an increasingly uncomfortable exercise in building tension and empathy for a family dealing with loss, the final stretch is nerve-shredding perfection, exactly the kind of experience that leaves the viewer screaming for mercy, but ignores those cries in favor of twisting the blade. Hereditary is the truth, and its terrors will follow you around for days after the final drop of blood falls from the screen. Masterful. Have Your Say: Why Do You Watch Horror? SXSW 2018: Midnighters Unveiled! FIELD GUIDE TO EVIL, THE RANGER, HEREDITARY, GHOST STORIES, UPGRADE, and More!